Colonel Zack Kelly spots the killer and gives chase, but the shooter is hit by a truck and killed. Zack and his partner, Lieutenant Colonel Rene Garcia, determine that Hightower is the sixth army leader attacked in the past four months. They investigate the chilling possibility that the shootings are part of a plot against the government. Is a serial killer on the loose? Are other lives at stake? Cabinet members? Is the president himself at risk? Things are not as they seem, however. After two more military retirees are murdered, Zack's world is rocked by an event so traumatic, the hunt for the killers turns deadly personal. 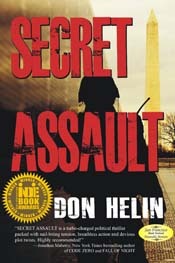 "Don Helin's latest is a terrific, prescient tale in which the ghosts of the past and the present converge in an all-too plausible conspiracy aimed at the highest corridors of power. Rich in the traditions of W.E.B. Griffin, Nelson DeMille and Tom Clancy, this is the best military thriller you will read this, or maybe any, year." –Jon Land, award winning, bestselling author of STRONG RAIN FALLING. "Rock-em-sock-em, ball of fire, roller-coaster, take your pick: Don Helin covers them all in this terrific book. Do yourself a favor and get one . . . and be prepared to stay awake far, far into the night."